You can adapt this to suit your family: leave out the praline or serve biscuits instead of the filo if you are in a rush. If you can't find petals from untreated roses, use rose water. Put the sugar, lemon peel, cinnamon stick and 500ml water in a pan and bring to the boil. Boil for 5 minutes, then add the fruit. Reduce the heat and cover the fruit with a disc of wet baking parchment. Simmer for 10–15 minutes, till softened. 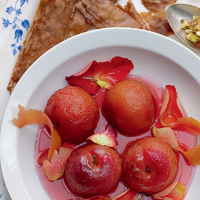 Discard the parchment and add a few rose petals, or the rose water. Simmer for 2 further minutes, then leave to cool. Preheat the oven to 180°C/gas 4 and line a 40cm x 20cm baking tray with baking parchment. Brush 1 sheet of pastry with melted butter. Scatter half the sugar over, then cover with a second sheet of filo. Repeat the butter and sugar technique, then add the last sheet of filo, brushing the top with butter. Cut into 12 x 5cm strips and put on the baking tray. Drizzle with the honey and bake for 10–15 minutes till golden and crisp. Transfer to a tray lined with fresh baking parchment and leave to cool. For the praline, grease a flat baking tray. Put the sugar and 2 tbsp water in a small pan on a medium heat. Leave to dissolve for about 4 minutes, then boil till golden – don’t stir, but do swirl the pan a few times. Take off the heat and stir in the nuts. Pour onto the tray and leave until cool. Break up the pieces, then bash or pulse in a food processor until the praline is in crumbs. Mix the yogurt with a little of the fruit syrup to sweeten. To serve, put some fruit with a little syrup in a bowl. Serve with the filo biscuits, the praline crumbs and the sweetened yogurt. A glass of chilled tawny port is a subtly fruity counterpoint for this pud.